Portlanders to City Council: No More Delays, Raise the Wage! 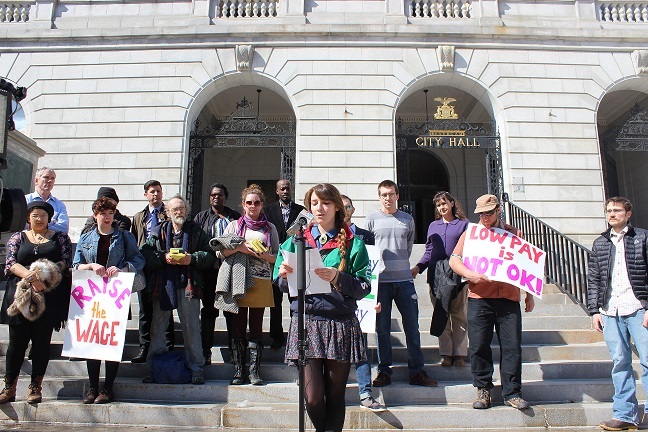 Portland residents, low-wage workers and small business owners delivered stacks of postcard messages to City Council members today urging them to adopt the Mayor’s proposed ordinance to raise the minimum wage. The Mayor’s proposal calls for a city-wide increase in the minimum wage to $9.50 an hour this year and to $10.68 in the near future. It is unlikely that the finance committee will take up the proposal when they meet Thursday evening, again delaying action on the issue. Small business owners joined the event and noted how an increase in the minimum wage would stimulate the Portland economy. Portland is among a handful of cities in Maine that are considering raising the minimum wage by local ordinance. At the state level, seven bills have been introduced by legislators to raise the minimum wage to levels as varied as $8 to $12 an hour. A report released by the Maine People’s Alliance and the Alliance for a Just Society last week calculated a living wage in Maine should be roughly $15 for a single adult and that more than half of the available jobs in Maine pay less than that number.